Start with a Question: What Would George Washington Think of the Internet? What Would George Washington Think of the Internet? The way we communicate is more instantaneous and media-rich today than ever before in history. But both history and modern times are peppered with testy relationships, varying personalities, and complicated politics. While we sometimes think that life is so different today from the start of U.S. history, we have more in common with the people who lived at the beginning of our nation's story than we think. This also means that we struggle with communication in many of the same ways. Using the lesson and materials below, you can help your students feel more connected with history by talking with them about the ways they connect with one another online. Earlier this week, Safer Internet Day was observed in over 100 countries all over the world including the United States. 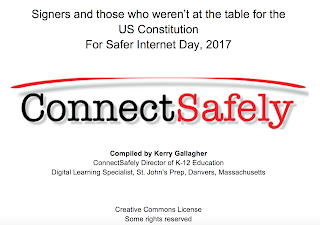 This year's theme is Be the change: Unite for a better internet and the event was held at the National Constitution Center in Philadelphia and was hosted by ConnectSafely. Throughout the event, the speakers and performers reminded the nearly 200 students in the audience that their actions and voices are more important than they think. The young users of technology today are creating the internet of the future with every swipe, keystroke, and photo/video upload. In the same way our nation's founders were shaping the future as they drafted the Constitution, we are influencing the future every time we hit post or publish. I was honored to help design and kick off the student activity portion of the day. We asked the participating students, who hailed from schools in Philadelphia and the surrounding towns, what early U.S. citizens and residents might say about the way we use the internet today. Their answers were inspiring and we captured a few with photos. "I keep my family secrets but I see photos of yours every day." but many people overshare that kind of information online today. "Although I don't agree with you I respect your opinion"
"Burr! Your comments are killing me!" and Aaron Burr that eventually led to a deadly duel. They tried to imagine how they might interact on social media. "Internet? Massah told me not to read." those who are educated and able to access it. Slaves were forbidden from learning to read. You can help your students make the connection from their digital lives to the revolutionary lives of our early countrymen, too. Click the image below to access the lesson resources. Click here to access the lesson materials. Digital Lesson with Memes: Let students screenshot the portraits and then put the photos into Skitch, Phonto, or some other free image annotation app. Students can create memes in which the individuals featured in the lesson materials answer the questions based on the biographical information and direct quotes provided. Memes can be submitted via Google Classroom or some other LMS assignment submission feature. Low Tech with Post-Its: Print and post the 8 portrait photos with corresponding info-sheets around the room. Divide the class into 8 groups. Each group takes 3-5 minutes at each of the 8 stations to read the info-sheets and write an original quote on a Post-It note from the perspective of the person in the portrait. As groups rotate, they are challenged to avoid repeating the quotes on the Post-Its from the groups that preceded them. It is important to close the activity with a class discussion and reflection. In our case, we asked for student volunteers for a final panel. Panelists ranged in age from 10 to 18 and shared their greatest takeaways and how they plan to take what they've learned back to their school communities. If you use this lesson, or some version of it, at your school and in your classroom, please share the results on Twitter and tag @ConnectSafely and me, @KerryHawk02. Also use the official Safer Internet Day hashtags #SID2017 and #SIDUSA. Tiffany Hall from Florida did and her students' work is impressive! We want to help amplify your students' voices so they can be the change and know their ideas are essential as we unite for a better internet.